Hi. I plan to purchase a small, 7' 3" dinghy (Achilles LT-2) with my British Seagull so my wife and I can journey to shore without swimming. I have been contemplating various storage solutions and prefer not to unroll and pump the dinghy every time I want to use it. I'll store the British Seagull in the engine compartment. 1) Davits -- not to many options for us double enders. I have a swim ladder but not a platform, so I can't install those nifty pivot cradles. 2) Install some type of cradle system--preferable stainless--on the roof of the wheel house. It would slightly obstruct my view when using the outside helm. I can see the dinghy getting in the way of my bimini, GPS antenna, anchor/steaming light, and Teleflex/Morse controls. 3) Store the inflated dinghy on the bow of the boat. Problem with this option is the dinghy would get in the way when anchoring--unless it goes into the water before anchoring. 4) The option I am seriously considering: Attach the dinghy to my swim ladder vertically when storing. Not clean looking but may be my only option. The ladder can be turned upside down, on the mounts, for storage so the steps are out of the water. I can visualize the dinghy carefully attached to the ladder via straps or bungees. Any guidance and thoughts is most appreciated! You've covered just about everything but towing! What's wrong with towing? Thousands of sailors do it! No limits on how big the dinghy is either. We have towed our dinghies of various types for close to 30 years now without major problems. Just remember, religiously, to pull the dink in tight for any maneuvering or you will definitely regret it. We have just added davits only because of a contemplated upcoming canal trip since we understand towing a dink is frowned upon in locks. The davits are a bit of a pain to use. You are right--silly me! I've never been partial to towing (images of a small dinghy lifting off with a strong wind) but I don't see too many viable options. Perhaps a simple hybrid solution: (1) tow when underway and at anchor and (2) store vertically, out of the water, and covered on the swim ladder when at the marina. We have towed our dinghies of various types for close to 30 years now without major problems..
David: Somewhere on your computer you have a pic of Emily Ann towing your dink in the mist. (Sounds vulger doesn't it?) I'm pretty sure it was your boat and as I recall, it was a great photo. You emptying the holding tank there Walt, or is that color normal in your waters? VT " (images of a small dinghy lifting off with a strong wind)"
Get a bigger dinghy with a reasonable outboard, and tow it. Yes, but the question is where do I store this large dinghy at the marina? I can tow it, but I have to store it somewhere and not at the dock. I also have to put the outboard somewhere and take it off. My trusty Seagull fits nicely in the engine compartment and I can carry it with ease--so a larger outboard is not an option (I'm not a large trawler with a winch). just pull it along side at the marina. personally , i prefer to tow. Why not try the ladder mount to see if it works, it needs no mods unlike most of your options. I had a towed dinghy flip in strong wind, it formed a kind a vacuum attachment to the water, there are times not to tow. We have enough space to secure our 2.7M inflatable in the cockpit when offshore. Caution stops me storing the outboard or the spare fuel in the ER or bilge. I like your choice of a Seagull outboard. I think you are right BruceK. I'll give it a try and get over my towing concerns. Good point about fuel in the engine compartment. Seagulls are notoriously reliable but notoriously "self-lubricators". My engine compartment is outside and has ventilation, but I'll make sure the tank is drained before storing. Incidentally, my Seagull was bought new in '83, belonged to my father (B-day gift from Mom), and now serves me well. She was accidentally dunked in sea water in '84 and started right back up after a thorough cleaning. To this day it always starts after one or two pulls! I should be so lucky to have a holding tank that size. No, I pulled that pic right off the Internet. I think it was taken somewhere in the Sacramento Delta area. Perhaps the props are stirring up bottom mud. Much of San Francisco estuary (which includes the Delta) contains shallow water. Some of the water (such as the upper reaches of the Petaluma River/Slough) is so brown it's difficult to tell when one is "bottom stirring." ... I think it was taken somewhere in the Sacramento Delta area. Whatayamean muddy water? That ain't muddy water. Here's muddy water! 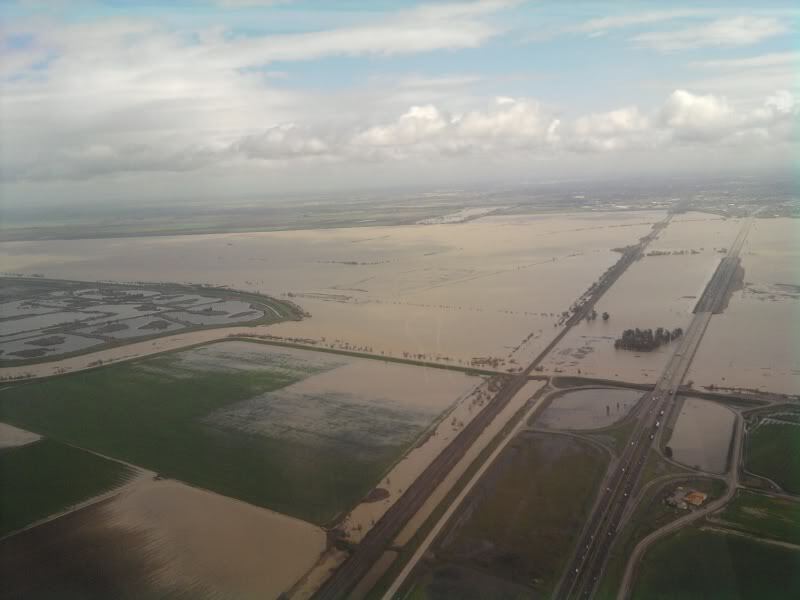 Pic taken above the Sacramento River Bypass during flood season east of Woodland, CA. These waters flow from the Sac River through the open wier into the Yolo Bypass and back into the the delta from Liberty Island, through Cache Slough and back into the Sacramento River north of Rio Vista, CA. I have no idea where that picture was taken! I said that to ruffle a few feathers in the Delta cruising crowd and they agreed with me! LOL!! We like water with texture! Back on topic, on my 28-footer I had very little storage. I used an 8' roll-up dinghy with slat floor. I'd tow it when going from anchorage to anchorage at trawler speeds, but when on plane or going to a marina I'd dry it out, roll it up and leave the bag wherever it was least in the way. No good options. One thing I'd add about towing; consider how much you value the engine. I've seen a good wind, or even a good wake, turn towed dinghies upside-down. Finally, remember that PVC will be seriously degraded by the sun, they need to be covered or stowed as much as possible. For a couple of years, I kept my deflated Achilles LEX-96 in my lazarette. At about 75 lbs, it was manageable and didn't take up too much space. The wood floor separates into 4 small pieces. I'd inflate it at our destination in my cockpit, then tow it from spot to spot for short trips, as needed. I also have the Honda 2HP 4-stroke motor that weighs in around 27 lbs. Together, they make a nice package for moving from boat-boat or boat-shore at anchorage. Lately I've taken to tilting the dink up on the swim step since I have room and it doesn't interfere with much there. I'm currently shopping for a 10.5 ft RIB to replace this one b/c I'm interested in going faster and using the dink to explore new locations rather than just move 2 of us from boat-shore. Contemplating dinghies on our 30' boat is bad enough but the Vashon is much smaller ... a real problem. Davits are great. Don't rule them out. Lots of Willards (30') have davits. Launch the dinghy and use a boarding ladder on the side. Davits are the only good solution but with moorage rates what they are ??? We towed when we had an Albin 25 in the Puget Sound area for one year and things went quite smoothly ... but not ... very smoothly. I eventually built spars protruding off the side decks aft and the 7' dinghy (FG) rode well there. Launching and retrieving was a little dicy but I have quite good balance and never did fall in. If you tow w a light rubber duckie you can throw it up on the foredeck while in port. Speaking of rubber duckies get one w/o a transom and w the soft floor. Think 35lbs. Forget the SeaGull. Get the noisy Honda FlyWright suggests. Consider the German electric Torquedo OB also. Use the clamp on engine mount. We got a duckie w the transom and would gladly trade for non-transom version. Soooo light. We now use the roof on our 30' boat (see avatar) and are basically very limited in weight capacity. Thinking about a small lightweight crane. Another option is open to both of us and that's the side deck ... port side obviously. I have seen numerous fishermen in Alaska put a7' "SportYak" on edge hugging the side of the cabin. Perhaps a small Porta Bote folded would fit there. Another fish boat option is to mount the dinghy on a platform or rack over the aft deck high enough for head room below the rack. When small trollers were everywhere in SE Ak most carried their dinks thusly. Using aluminum and a very light dinghy this is probably the best option for you. Especially if the Vashon has some ballast. Towing is ok if you boat in peaceful waters and don't overnight in marinas. Use an inexpensive dinghy and let the PITA elements of towing propel you fwd to plan B. The dinghy is a wonderful asset not to be rejected. However We have made two 1000 mi trips w/o using our dingy. Perhaps we should have been towing as we definitely would have used the dink then.